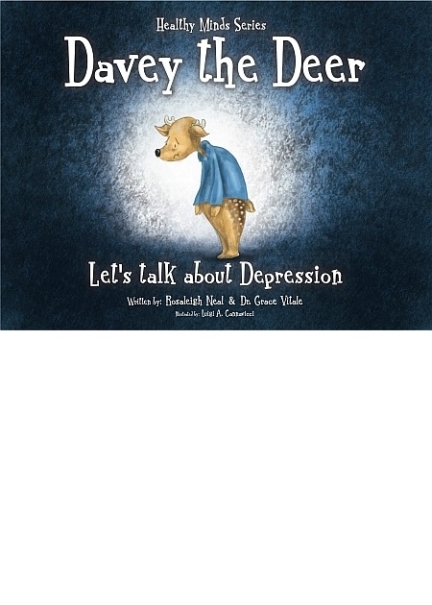 The first book in the Healthy Minds Series is entitled Davey the Deer: Let’s Talk About Depression. This book will be available in the late Spring of 2016. Depression is a mental health disorder that is affecting more and more children each day. It is an issue on the rise that needs to be addressed and treated. It’s time to break the stigma. Children are overwhelmed with the many demands of school, parental expectations, extra-curricular activities, and the pressure of social development. Davey will lead you through his journey. Do you see any issues that are similar to your particular situation? Have you started a dialogue? What are your next steps? Let this book be the foundation you need to start the dialogue. Healthy Minds Series is a book forum that opens various pathways to foster important dialogue around mental health issues. These books are tools to be used as conversation starters between concerned adults and children. Each book will address a particular mental health issue a child may be facing. In addition to aiding in the commencement of important dialogue, adults are encouraged to read each book carefully before using it as a tool, as each book is tailored to present a typical day or week in the life of a child suffering from the particular mental disorder in question. Each page has been created to show a different symptom or situation that may arise due to the difficulties that these children may be encountering on their daily journey. Other family members are also presented in each book. These members are often portrayed as reacting in a typical manner when trying to help the child in need. In order to use the books as efficient tools, it is imperative that the adult studies the main character featured in each book, as well as the supporting characters. It is for this reason that, in reality, the books have no particular target age, or age limit, as adults may also identify with the supporting characters. Each book has a professional column written by Psychologist Dr. Grace Vitale. This column addresses common symptoms to look for in each disorder. It will also highlight next steps to take, and will present resources for families who need guidance and direction. Mental Health Awareness has numerous facets that can be discussed, and treated. It is important to note that the characters representing the issues addressed in the books are not representing any real-life cases. The stories are fictional, yet the symptoms the characters display in each book reflect the DSM-IV, which is a psychological manual that assesses and diagnoses psychological illnesses. Furthermore, you or the child who needs your support, may identify with few, most, or all of the symptoms presented. However, only a psychologist can diagnose a particular disorder. These books are not intended for self-diagnosis, but to provide support in a way that children can identify with, in an open, child-friendly manner. Rosaleigh Neal, OCT, teaches French Immersion in the Elementary School panel for the York Catholic District School Board, holding both a Specialized Honours in French Studies, and a Minor degree in Psychology. Rosaleigh has developed the Healthy Minds Series to provide a comfortable atmosphere for adult-child discussions about Mental Health Issues. Her love for children, her devotion to helping those in need, and her adoration of animals inspired this book series. Growing up reading volumes of children’s books, she hopes that families will become closer reading the Healthy Minds Series, undoubtedly providing not only support, but also a moment in time to bond, reflect, help, and love one another. Raised in a lively, supportive household, Rosaleigh developed strong family values, learning that happiness is a balance between physical, social, and mental well-being. Rosaleigh now lives in Brooklin, Ontario with her loving husband of two years, Andrew, and energetic Labradoodle named Indy. Dr. Grace Vitale, Registered Psychologist, works in the Elementary School Panel for the York Catholic District School Board. Known for her caring, patient, demeanor, Healthy Minds Series is the perfect forum for her to give her opinions, shape each story, and add important, significant details rendering the stories more believable and helpful. Her professional column in each book will provide the reader with the necessary information needed to guide his/her journey down the road to mental wellness. Dr. Grace Vitale and her husband, Dr. John Luke Vitale, Associate Professor of Education, live in Maple, Ontario. They are currently raising two teenaged boys and one elementary-aged daughter, stressing the importance of education and healthy, balanced lifestyles daily. Dr. Grace Vitale maintains an extremely busy work/home life. Along with assessing children for the school board, she also has a private practice, juggles the scheduling demands of her children’s extra-curricular activities, the challenges of caring for a new puppy, and many other important family obligations. Luigi Cannavicci was born with the creative gene. He discovered his talent at the young age of 8, with the help of The Secret City; a 1980s kids art show. He hasn’t looked back since. As a result from graduating from Humber College’s Advertising and Graphic Design program, Luigi Cannavicci has a strong command of Adobe Photoshop and Illustrator-two of the programs used for his illustrations. From creating storyboards and conceptual art, to full coloured illustrated children's books, he brings a unique perspective to the work he creates.